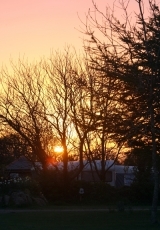 Storage facilities are available on site in our secure compound throughout the year for those wishing to leave their caravan close to their holiday destination, Cornwall. As part of the caravan storage facility, you can telephone in advance to have your caravan ready and waiting on pitch for your arrival – a hassle free start to your holiday, we’ll even clean it for you, see below! Our staff will remove your caravan from storage and will thoroughly clean the exterior at our on-site jet wash.
£49.50 – includes siting your caravan on a pitch or making it ready for towing off site.